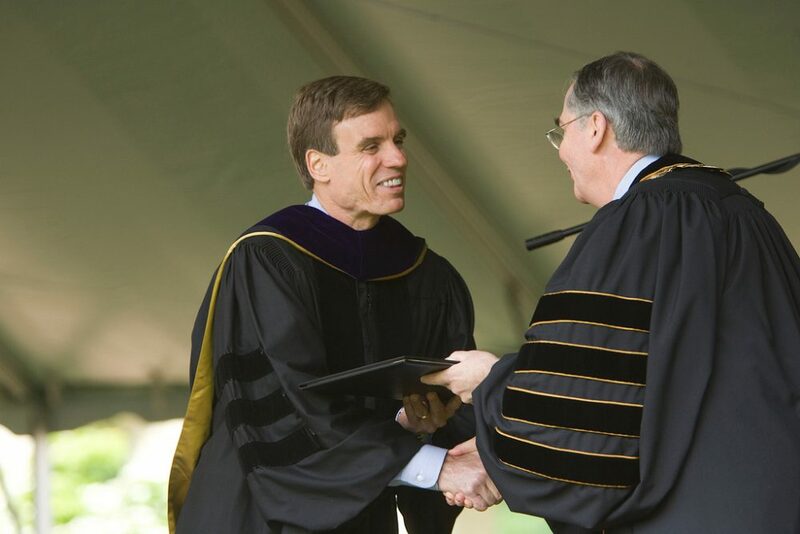 Former Virginia Governor Mark Warner, who delivered the Commencement address, received an honorary doctor of laws degree. Author and preacher Barbara Brown Taylor, who delivered the Baccalaureate address on May 14, received an honorary doctor of divinity degree. 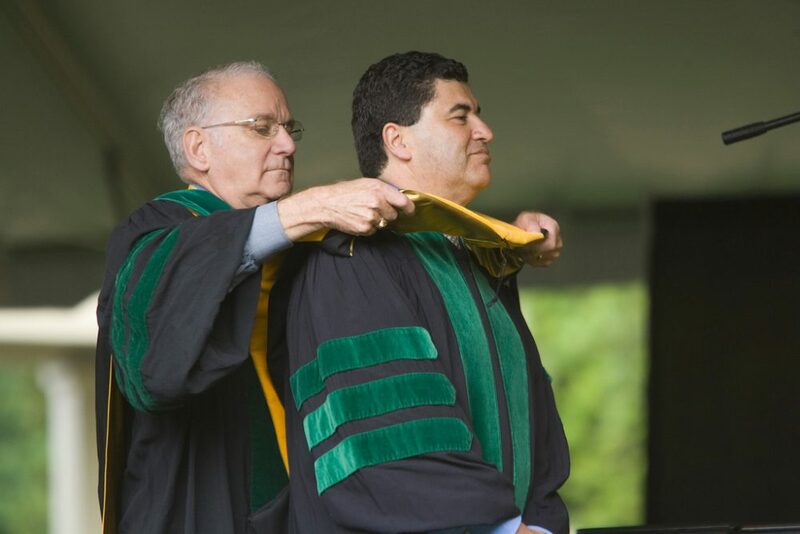 Prominent medical researchers Elias A. Zerhouni and Walter A. Orenstein received honorary doctor of science degrees. Zerhouni is director of the National Institutes of Health. 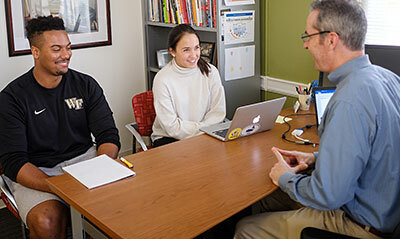 Orenstein is associate director of the Emory University Vaccine Center and a former director of the Centers for Disease Control and Prevention’s National Immunization Program. 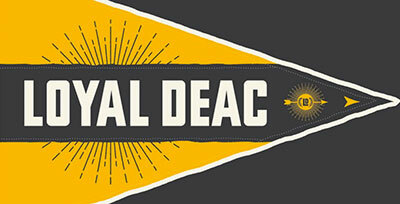 Wake Forest has awarded honorary degrees since 1849. 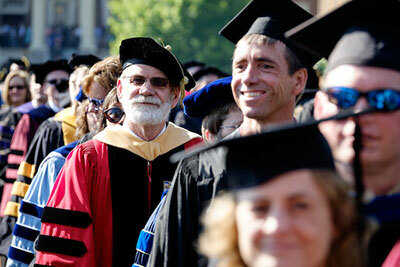 The first honorary degree was awarded to Wake Forest founder and first president Samuel Wait. Former Virginia Governor Mark Warner left office in January as one of the most popular governors in Virginia history. He was described recently in The New York Times Magazine as “the bright new star in the constellation of would-be candidates” for the 2008 presidential race. A native of Indiana, he graduated from George Washington University — the first member of his family to graduate from college — and received his law degree from Harvard. He was a leading figure in the telecommunications industry in the 1980s and co-founded Nextel Communications. He began his political career in 1993 as chairman of the Democratic Party of Virginia and was elected governor in 2001. He was recognized by Time magazine as one of the “Five Best Governors” in 2005, and by Governing magazine as one of its “Public Officials of the Year” in 2004. The Rev. 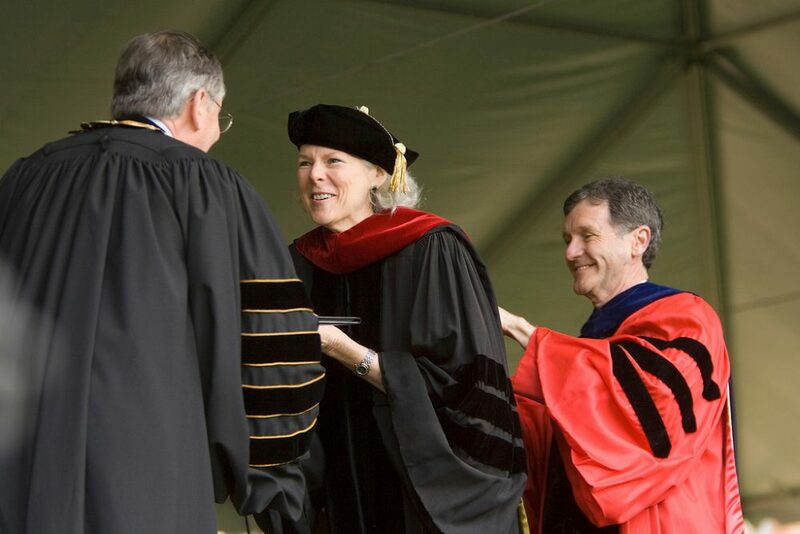 Barbara Brown Taylor, a religion professor at Piedmont College in Georgia, received an honorary doctor of divinity degree. Taylor is an Episcopal priest who teaches religion at Piedmont College in rural northeast Georgia. She also serves as adjunct professor of Christian spirituality at Columbia Theological Seminary in Decatur, Ga.
Before becoming a full-time professor in 1997, Taylor spent 15 years in parish ministry. She has lectured on preaching at Yale, Princeton and Duke universities and has preached at churches across the country. 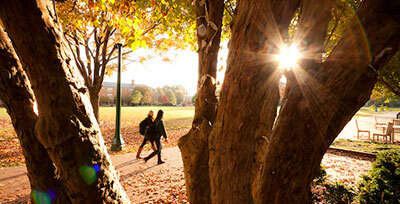 In 1995, Baylor University listed her among the 12 most effective preachers in the English language. She is also a columnist, radio commentator and author of 11 books. Taylor gave the keynote address at the university’s May 14 baccalaureate service in Wait Chapel. Elias A. Zerhouni, director of the National Institutes of Health (NIH), received an honorary doctor of science degree. Since being named director of the NIH, Zerhouni has been credited with doubling the NIH budget and with awarding more research grants, instituting more training and supporting more clinical trials than ever before. He has established numerous initiatives, including the NIH Roadmap for Medical Research and the Strategic Plan for NIH Obesity Research. He established an historic public access policy that allows public access to research publications resulting from studies funded by the NIH. Prior to joining the NIH, Zerhouni served as executive vice-dean of Johns Hopkins University School of Medicine, chair of the Russell H. Morgan department of radiology and radiological science, Martin Conner Professor of Radiology and professor of biomedical engineering. His research has earned him several awards and led to imaging advances that resulted in 157 peer-reviewed publications and eight patents. 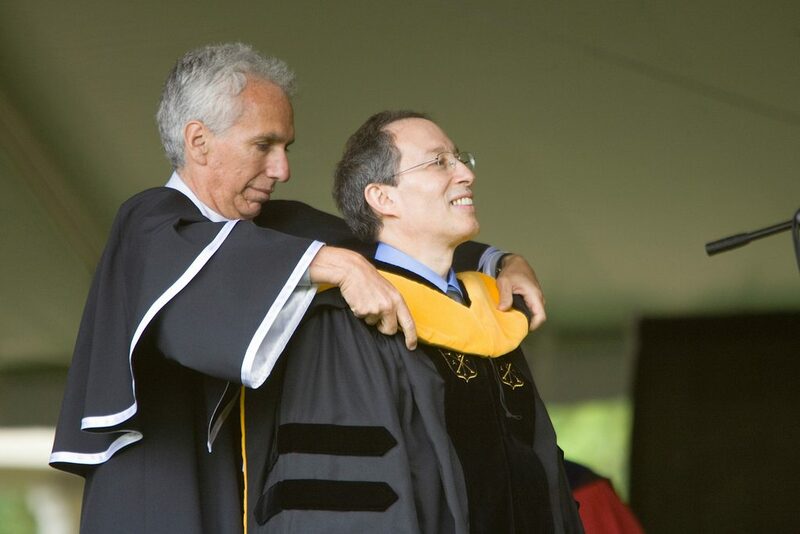 The university also awarded an honorary doctor of science degree to Walter A. Orenstein, associate director of the Emory University Vaccine Center, former assistant surgeon general of the U.S. Public Health Service and former director of the Centers for Disease Control and Prevention’s (CDC) National Immunization Program. Orenstein spent 26 years with the CDC focusing on infectious diseases and immunizations. He is credited with attaining the highest immunizations levels ever in U.S. children and is the recipient of numerous awards, including the Surgeon General’s Exemplary Service Medal and the United States Public Health Service Commendation Medal. Orenstein has also authored or co-authored more than 100 published studies, reviews and book chapters for medical books and trade publications.